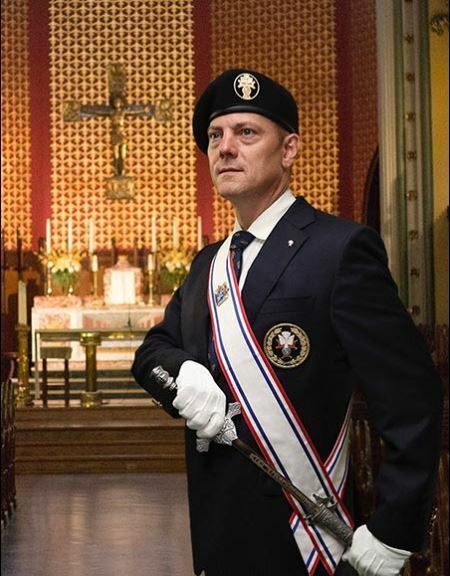 Patriotism (4th Degree)- Members of the Knights of Columbus, be they Americans, Canadians, Mexicans, Cubans, Filipinos, Poles, or Dominicans, are patriotic citizens. We are proud of our devotion to God and country, and believe in standing up for both. Whether it’s in public or private, the Knights remind the world that Catholics support their nations and are amongst the greatest citizens. in union with the Holy See is eligible to join the Fourth Degree Knights. 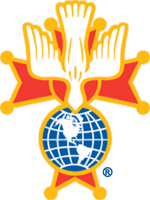 Emblem of the Patriotic Degree The triad emblem of the Fourth Degree features the dove, the cross and the globe. The dove, classic symbol of the Holy Spirit and peace, is shown hovering over the orb of the Earth (globe). Both are mounted on a variation of the Crusader's cross, which was found on the tunics and capes of the Crusading knights who battled to regain the Holy Land from the pagans. and to the Knights of Columbus.